The new Vicar of Abergavenny will be Inducted on the Feast of Epiphan, January 6th. Among the floral displays will be one featuring three kings by members of Abergavenny Floral Society which was previously used at a regional flower festival of the National Association of Flower Arranging Societies, which Fr Mark helped arrange at Newport Cathedral in 2008. Music at the service includes a piece composed by the Priory Church Choirmaster, Tim Pratt, based on words from the Book of the Wisdom of Solomon. “Be not wise in your own eyes. Lean not on your own understanding, trust in the Lord”, words which form Fr Mark’s personal motto. The service will be lead by the Bishop of Monmouth, assisted by the Archdeacon of Monmouth and the Area Dean of Abergavenny. Wardens from the four churches (St Mary’s Priory, Christchurch, Holy Trinity and St Peter’s, Llanwenarth) will present him with ceremonial keys for the four churches to be put in to his care. Civic, local church and political leaders, along with representatives from all organisations Fr Mark is involved with are expected to attend. The Service which starts at 7.30pm is open to all. A Service of Thanksgiving for the life of the Very Revd Jeremy Winston will be held at St Mary’s on January 21 at 11.30am. The service will include tributes from his cousin, Lord Rowe-Beddoe, Bishop David Thomas and the Revd Malcolm Lane – they will speak about his family life, his influence in the Church and beyond, and his pastoral life as well as Jeremy-the-man. His love of music and words will be explored in choral pieces, hymns, poetry and prose – some of which was he wrote. Admission will be by ticket only. They are available, on a first-come, first-served basis, by sending a stamped addressed envelope to St Mary’s Vicarage, Monk Street, Abergavenny NP7 5ND. Please mark your envelope ‘Thanksgiving Service’. ALL TICKETS HAVE NOW BEEN ALLOCATED. HOWEVER, ADDITIONAL SEATING WILL BE MADE AVAILABLE IN THE PRIORY CENTRE. FOR MORE INFORMATION, PLEASE CLICK HERE. 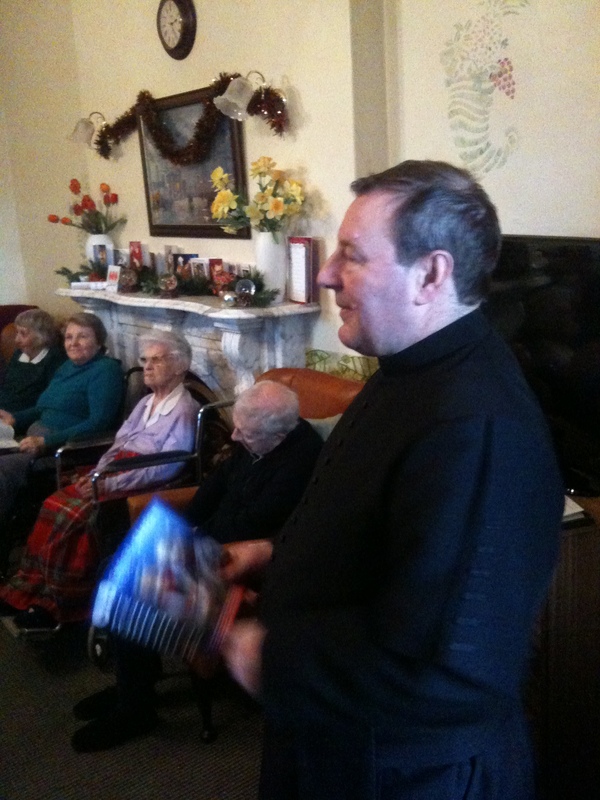 As part of yesterday’s Monastic Day at St Mary’s Priory, the labora (work) was spent visiting the four nursing homes in Abergavenny: Avenue Road, Belmont, Cantref and Rozelle. Fr Mark Soady, Fr Bernard Sixtus and Fr Chris Walters were joined by several members of the congregation to wish residents a very happy and blessed Christmas. 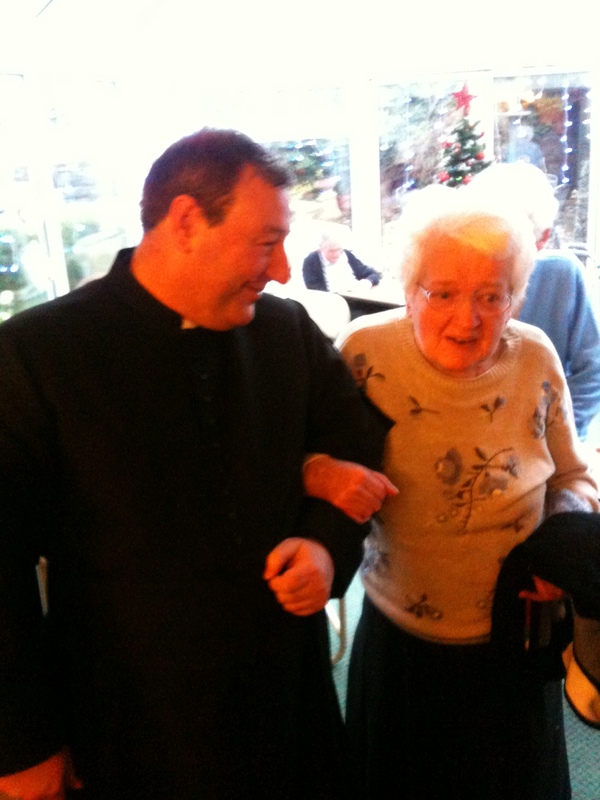 At each nursing home there was an opportunity for prayer, a short reading and the singing of Christmas Carols – selected by the residents. Tithe Barn manager, Richard Morgan, accompanied the singing on a portable piano. The staff at the nursing homes made us very welcome and it was a pleasure to be able to speak to the residents. The hospitality at Cantref was very much appreciated: the cup of tea and mince pie were enjoyed by all! 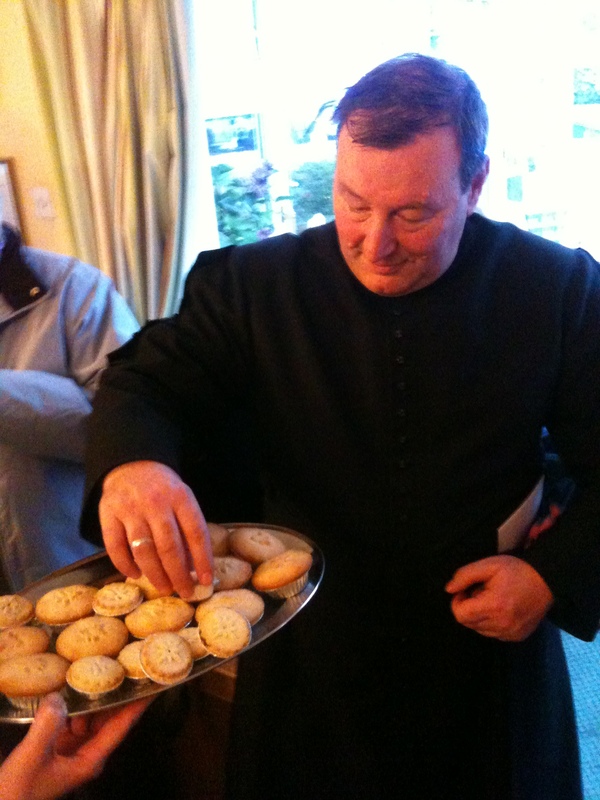 Fr Mark samples the mince pies! The religious advisor to the popular TV series ‘The Rev‘ has been quoted recently as saying how stressed ministers of religion get in the run up to Christmas. What a rush it has been been for me this year, what with moving house on December 19th, wrapping things up in Newport and preparing to hit the Abergavenny ground running. One hears people say it shouldn’t be like this, but that is just how it was that first Christmas for Mary and Joseph. Those blessed Romans had decided to have a census and so they both had to go to Bethlehem, and with Mary heavily pregnant. Then to top it all, when they got to Bethlehem there was no where free for them to stay, so they opted for a stable. Did they get peace and quiet there – NO! They were visited within hours of the baby’s birth by shepherds and a few weeks later by men from the east. As if that wasn’t enough they had to flee to Egypt from that tyrant Herod killing all the new born boys. We like to think of the Babe of Bethlehem has having been born in a picture post card scene. However, when God choose to come to earth he did so in a way which made it clear that he wasn’t going to give himself any easy time. He was going to rough it with the rest of us. How loving is that? A God who was willing to become man, and expect all the hardships that went with it- even the most cruel of deaths. May He bless you this Christmastide. Just hours after the removal men had finished delivering furniture and boxes to the Vicarage, Fr Mark was entertaining his first guests! The dedicated team of bell ringers were invited to meet Fr Mark at home and relax with a glass of wine and nibbles following their practice in St Mary’s Priory last night. During the afternoon, Fr Mark had been busy unpacking boxes and arranging furniture to enable this gathering to take place. Tower Captain, Peter Munday, and the other ringers certainly appreciated his hospitality on such a busy day. St Mary’s has a ring of 10 bells, the tenor weighing in at 25 cwts 18 lbs. At the dissolution of the monasteries in 1536-39, the parishioners bought the four bells, weighing a total of 45.5 cwt, which hung in the Priory Church. 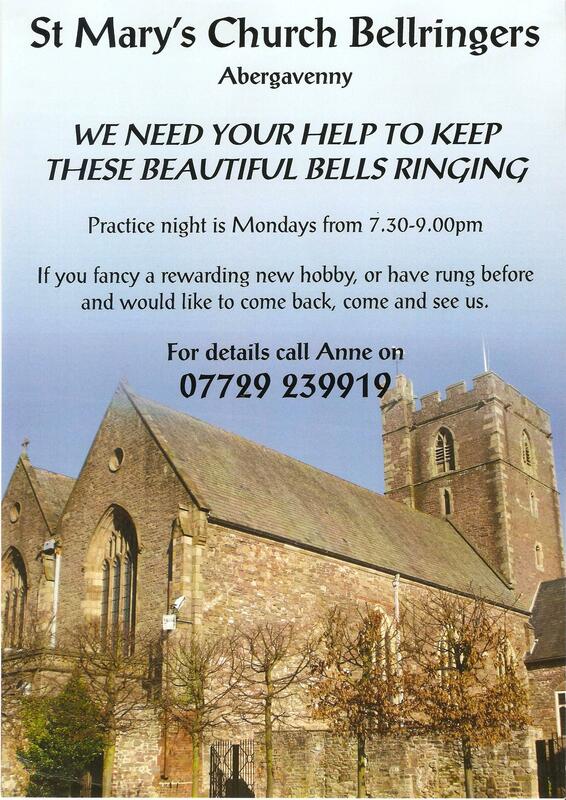 St Mary’s has a thriving group of bell ringers, who meet to practise at 8pm on Monday evenings. The bells are rung before the 11am Parish Eucharist on Sundays and also at weddings and other special occasions. Bell ringers from all over the country visit St Mary’s to ring. 90.10 Yet another van and another removal van. Three vans and 4 men. Fr Mark catches up on his emails on his iPad as the men efficently clear the house. 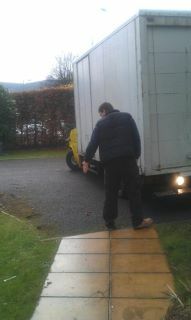 The hardest part of the removal men’s job is getting their vans down the All Saints drive. 11am We are ready to leave Newport for Aberagvenny, with the promise of less rain in the afternoon. 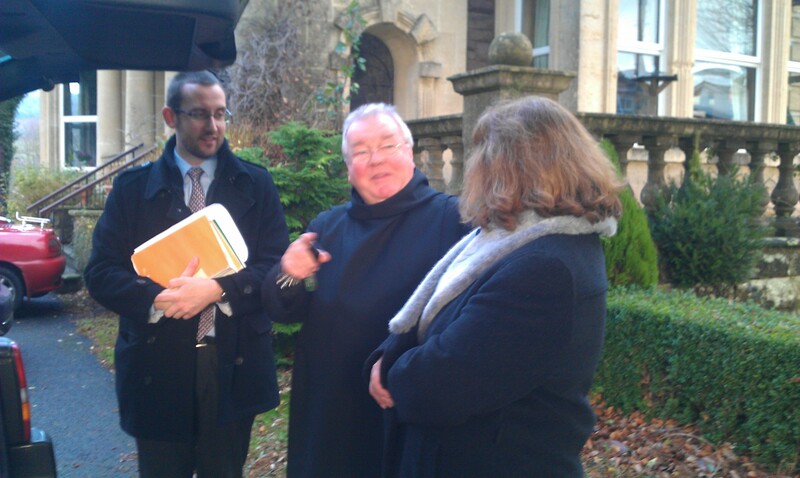 12.10 We arrive at the Vicarage.Thanks Richard for opening the car park gates. The guys have a cup-a-soup before starting to unpack and Fr Mark (thanks again) to Richard has a Tithe Barn Food Hall take away Cheese sandwich. Highly recommnded. It does not take the guys long. 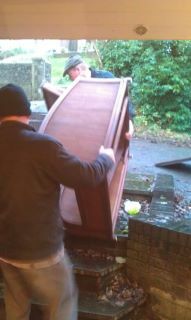 The wardrobe being the most difficult piece of furniture to manouver in. Meanwhile Fr Mark checks on email applications fro Fr Jeremy’s Service of Thanksgiving. 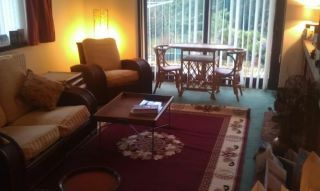 1.40pm The Study has become a temporary respository for all the rugs and pieces of furniture which can not be put in place immediately. 2.10pm All is in and the guys head off. Now Fr Mark’s work realy begins! 3.30pm The Living Room at least is looking like home. 4.30 It was good of Tim Pratt to pop in to say hello and welcome. After nearly nine years, the United States officially ended their operations in Iraq on Thursday, with a ceremony that ‘cased’ (retired) the US Forces’ flag before its return home. Within the next two weeks, all American forces will have left the country, bringing to an end a conflict in which, according to the BBC on Thursday, some 4,500 US soldiers, and more than 100,000 Iraqis died. The first thing that struck me, perhaps rather oddly, on reading this is how much time has gone by since the invasion of Iraq began in March 2003 in terms of my own life: I was at Mirfield in Theological College at the time, married but without children, and about to finalise arrangements for my curacy (getting quite excited at the prospect of living and ministering in Paris). It seems (almost) like another world, now – my curacy came and went (and, yes, Paris was great), and – three children later – we have been here in Abergavenny just under five years now. I suspect that something like this will be true for most of us: nine years is a long time in our personal lives, and for many of us much will have changed since March 2003, and not everything for the better for some. This initial thought matters because it should bring home to us that there is now a large number of children in Iraq who have not known their country without the presence of foreign forces whose influence can hardly have been experienced as uniformly benign. While much has indeed changed for each one of us, for Iraqis the great change may be just round the corner, working out how to end on their own a savage civil war that erupted in the aftermath of occupation, in a country where many are embittered by the whole episode. They will not be the only ones asking whether it was all worth it, but they will be the ones asking that question with most urgency. One thing all this should remind us of here is how blissfully peaceful recent decades have been, and life continues to be, in Europe, which less than a hundred years ago was plunged into two horrific wars in less than the space of a lifetime, wars that tore the whole continent apart and destroyed the lives of countless men, women, and children. The thought puts all that talk of a ‘war of words’ between the UK and France over recent decisions at EU summits in perspective, does it not? We are blessed, and we need to realise it – and give thanks for it. And we need to remember that an essential part of true Christian thanksgiving consists in the determination to be ourselves agents of God’s blessing to those in need. On our list of ‘those in need’, children in Iraq and elsewhere who have not seen or known a world yet in which war is but a memory for most, should be neither missing nor last. Thanksgiving Service: In order to ensure that all who attend have a seat, it has been decided to issue tickets to the January 21 Thanksgiving Service for the life of Fr Jeremy. These will be distributed on a first-come, first-served basis and 300 have been made available to our parishes today, before they are then sent to other people. Each ticket admits one person—because of the numbers expected, please only take one if you are absolutely sure you will be able to attend. Extra chairs will be available in both chapels and both transcepts, as well as the Priory Centre. Christmas Flowers: If you would like to contribute towards the cost of flowers at St Mary’s at Christmas, perhaps in memory of a loved one, please see Mrs Lillian Price. See churchwardens at Christchurch and St Peter’s for flowers there. Thanks: Many thanks to everyone who supported the Grand Draw, who sold and bought tickets and donated prizes. Thanks also to those who supported the coffee morning at which the raffle was drawn. Monastic Day: Wednesday, December 21. All are welcome to join us for any or all of the services. As part of Wednesday’s Monastic Day, the ‘labora’ (work) will be singing carols at our nursing homes, as follows—all are most welcome to join us: 2.00pm Avenue Road, 2.30pm Belmont, 3.15pm Cantref and 4.00pm Rozelle. Panto: There are still a few tickets left for the Panto on January 8 in Bristol. Please contact Sadie Sadie Watkins on 07970 732517 or Anne Parr on 859414 .